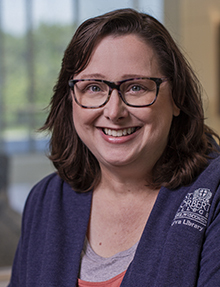 When starting at the Todd Wehr Library in 2006, Rochelle was responsible for serial publications in all formats: journals, newspapers and microfilm. With the continuing growth of electronic resources and databases, she has worked in electronic access maintenance which includes cataloging, proxy and resource administration. Now she also creates catalog records for all library and special collection holdings. Rochelle also sets titles and apps on our circulating e-readers, and keeps an eye on improving available technologies and assisting library staff to provide the resources needed for your course of study. As a Florida transplant, Rochelle is becoming quite fond of the four seasons here in Wisconsin. She has also developed a fondness for working backstage with some St. Norbert College and community theatre events. Talk to Rochelle about husbands who like fly fishing, high-maintenance dog breeds, working behind-the-scenes in theater and your favorite movies.